Since my last update on November 3rd, Curiosity has reached the region of sand dunes and has started to pick its way through it. The panorama above was created using images from the rover’s left navigation camera, taken on Sol 1516. It looks south, with Mount Sharp rising on the left. That same day Curiosity also used its mast camera to zoom in on the canyon gap in the center of the panorama. 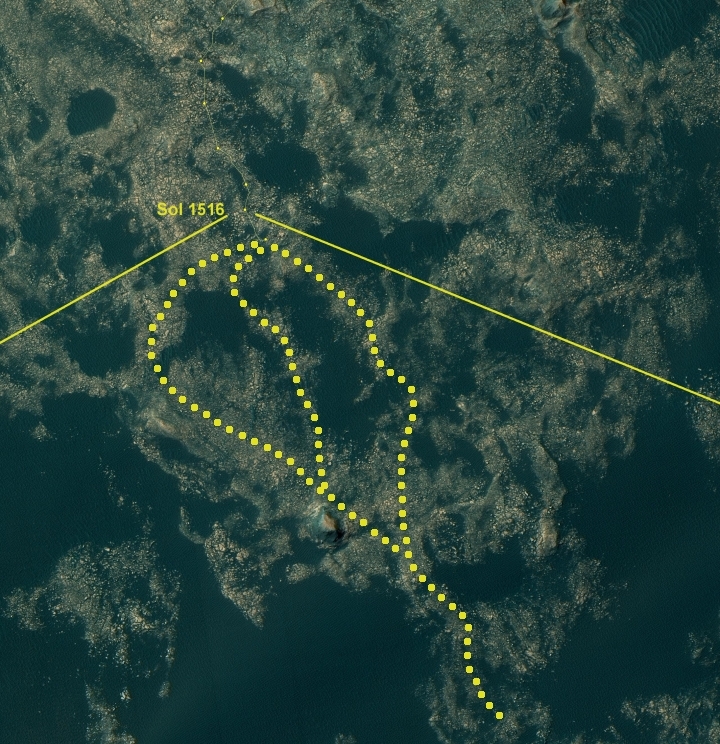 The first image below is the wider mast camera shot, with the an outline showing the even closer zoom-in below that. This canyon is where Curiosity is heading. First however the rover has to get through the dunes. Below is the most recent overhead orbital image of the rover’s location on Sol 1519, uploaded today by the Curiosity science team, annotated by me to indicate several possible routes as well as the general direction the first panorama above was looking. 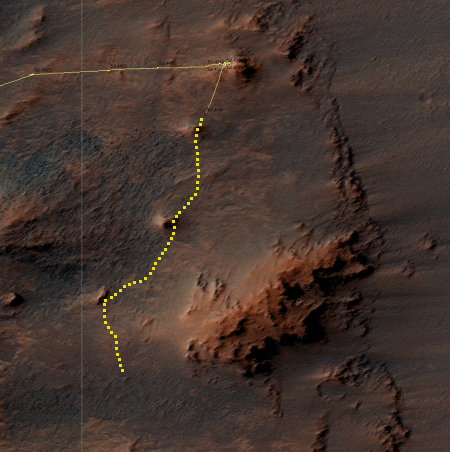 I fully admit that my guesses about the rover’s future travels are exactly that, nothing more than guesses. Regardless, we should expect the scenery to get increasingly spectacular in 2017. Since my November 3rd update, Opportunity has finally begun its journey south from Spirit Mound and within the rim of Endeavour Crater. The orbital image to the right shows this and has also been annotated by me with my guess as to their next targets. I had read somewhere, but now cannot find the link, that they intend to take a close look at all the mounds similar to Spirit Mound. At some point further south they will then exit the rim and travel into the crater floor.